Do Soundproof Curtains Work? - Sound Blocking Curtains Revisited. Home » Soundproof Products » Do Soundproof Curtains Work? – Noise Reducing Curtains. Do Soundproof Curtains Work? – Noise Reducing Curtains. admin November 21, 2018 November 22, 2018 2 Comments on Do Soundproof Curtains Work? – Noise Reducing Curtains. Which leads me to this crucial question – do soundproof curtains work? Well, yes. They cut down the sound up to a certain minimum. Although they may not block off the noise completely.. If the latter phrase sounds pretty uninviting, do not worry just yet. It’s important to note how these curtains work. And so, these curtains won’t clear out all the noise. But they reduce its impact in your room such that the sound is moderate and not really interfering with your peace. Let’s say your house is next to a major road or highway. The noise from the heavy, moving traffic will not spare your peace and you will almost hear them as if you were on the road. Installing the curtains on your room or windows to help prevent this commercial noise and vehicle uproars may not be as effective as you expect. Instead, you will just be in a position to muffle the echoes. Hence, they won’t penetrate inside to cause significant disturbance. These are acoustic treatments that help to absorb and dampen sound. They are heavy, securely knitted materials that are hung to cover the area from the ceiling to the floor of the house. They can as well be arranged to cover or surround the noisy objects. The sound curtains are usually created from one to many layers of dense materials. The dense materials are great in effective absorption of sound – and the main reason is that such materials have a higher mass. Usually, the layers (I just mentioned) will be made of mass-loaded vinyl right in the middle of the curtain. This vinyl can weigh anything from 0.5-2.5 lbs. per square foot. Now, this mass I have indicated above is the main factor that would determine how effective the curtain can soundproof your room. And, the curtains will often feel somehow rigid as they cannot easily fold. This unique property is due to the stiffness brought about by the mass-loaded vinyl inside the curtains. Since they are also weighty, you want to ensure that they’re hung on stable, heavy-duty frames. These curtains are able to absorb a certain amount of noise coming into your room. However, they may not be able to effectively quieten the house so that you don’t hear anything from outside or elsewhere. These acoustic curtains do well to cut off the echoing effect of the noise. They dampen the sound so that you are not irritated by too much noise. Different Types of Soundproof Curtains and My Recommendations. Many types of soundproofing curtains exist. However, these different types can be comfortably grouped as either residential and commercial soundproofing curtains or industrial soundproofing curtains. Let me explain this bigger picture first. Residential And Commercial Soundproofing Curtains. These kind of curtains come in lightweight. They are designed with decorative qualities that make them preferred for home use, film theatres, big auditoriums, and churches etc. Their design constitutes thicker, heavier fabrics such as suede, twill, wool, velvet or cotton. These can be eye-catching drapery treatments that will both create that aesthetic look and equally absorb the sound for your home comfort. While installing these curtains, you need to take great care. The reason for this caution is due to the heavy nature of these sound absorbing curtains. You may not fancy the appearance of the industrial curtains. They are not made to appeal to the eye. But rather, the design incorporates heavier blanket-like and quilted materials to provide better sound blocking properties. This kind of materials can give great noise-absorbing results. The noise control curtains are made specifically to be used for industrial purposes. They contain an incredibly heavy layer which separates two other sound-absorbent layers. The middle layer is made of mass-loaded vinyl just like the other curtains. The curtains can be used at a construction site in the urban areas. This is achieved by applying them around the perimeter of the whole site. This way, the people living in the neighborhood won’t be bothered by the excessive machine uproars. Even the manufacturing plants use these heavy curtains for soundproofing. You can install a soundproofing curtain around pumps, generators and other loud equipment. This will keep it cool at the offices or whatever work environment. Well, those are the broader types. But now, here are the more specific types. The thermal insulated curtains are designed with thick and heavy cotton or polyester materials. Other materials used to make them include velvet, silk or microfiber. The thermal curtains help to prevent air currents to escape or enter the room. This way, no much noise will get its way into the house. They come with a huge range of visual patterns and sizes. This helps you choose the best curtains for your already established home décor. It cannot go unsaid concerning the ability of these curtains to save energy. They are therefore energy-efficient. The NICETOWN Energy Saving Thermal Insulated curtain is a great option as it is fade-resistant, has been created with some amazing materials and the design is just fabulous. Another great type of sound-blocking curtains here. Blackout curtains are mostly used in those rooms which are exposed naturally to sunlight. They are built with some thick, noise-dampening materials. This makes them perfect in the environs with constant loud noise. You can as well consider mounting them in bathrooms. Just remember you will need blackout curtains with water-resistant fabric for bathroom use. These curtains can only block noise with a feature called Sound Transmission Classification (STC). Check for this Best Home Fashion Thermal Insulated Blackout Curtains. They help to block out sunlight and UV rays and are energy efficient. The sound screens have become a key feature of office interior design. And the reason for this – confidentiality and privacy. They are packaged with noise-reducing materials. Now, these are great for noise canceling. Curtains such as these have become favorites for most agencies. They can be placed outside the office or waiting room or hallway. Any noise will be filtered so that you don’t hear the disturbance completely. Marpac Dohm Classic White Noise Sound Machine is a sound screen preferred by many. It comes with a real fan inside and effectively masks the noise coming from outside the room. These may not 100 percent prevent the noise from reaching your room. But they will a good job to reduce the decibel level to tolerable degrees. These curtains are common in recording studios: they help keep off the reverberating echoes so that the recording takes place with no disturbance. Thicker and heavier blanket curtains can be used as heavy curtains for soundproofing for industrial purposes. They are usually thick with multiple layers of woven fabric material. Sound curtains and drapes can either be sound blocking or sound absorbing. The sound curtains are hung on the frame and would run from the top all the way to the floor of the. Sound drapes usually hung somewhere just below the window ridge. The NICETOWN Three Pass Microfiber is a good choice here. It is energy-efficient and easy to maintain. Acoustic curtains are porous and therefore can allow sound through them. As far as acoustic curtains are concerned, do soundproof curtains work? The answer will be a yes. These curtains have the sound absorbing materials. So the sound coming from the outside environment will be absorbed in the material. Which will cut off the sound echoes so that they’re minimized? The trapped sound is converted into heat energy. If you want an easy to install, great noise-absorber, check the Residential Acoustics Soundproof curtains. Its thermal insulating properties keep down your heating and cooling costs. Considerations Before Buying The Sound Blocking Curtains. Are you thinking of buying the best sound-blocking curtains? Then you need to continue reading through to discover some important things you must consider before making the purchase. Picking the right size of the curtain is as important as the purpose it’s going to serve. You will want the curtains you choose to cover the whole area whether it’s door or window space. Therefore, look at the ones which have extra-wide and long measurements. Because with the larger sizes, you are sure that will have your room adequately protected from excessive noise. The best noise canceling curtains are those that run all the way from the ceiling to the floor. If you want a highly effective curtain, you can’t rule out the three factors. Heavier and thicker curtains are good absorbents of sound. The lighter and thinner counterparts may not be the best for the same function. But only if you are considering serious soundproofing of your house. Check carefully the number of layers the curtains come with – and go for the multi-layered types. You will need to go a further step and check the materials used to construct the curtain. Different soundproof curtains are made of different materials. The curtain with the extra fibers in the materials should be your focus. The common materials such as suede, polyester and velvet are used in designing these curtains. So depending on your preference, you can make your perfect choice. Look for the best curtain rods that can hold the weight of the curtains comfortably. While many types exist in the market, the right fit for hanging your sound-absorbing curtain should be the priority. Always consider that rod that matches the design of your curtain. Many people overlook the element of research but it’s very vital. When it comes to getting the best of these products, conduct your research to get that curtain that will meet your set requirements. It is very easy to secure a great curtain through good research. There’s no doubt you will need to be faithful to your budget. Obviously, the budget for one set of curtains won’t be the same for another. At the same time, not all great sound dampening curtains should be bought expensively. Although the general principle is that better releases are going to sell higher in the market. This is a key factor you must consider. Most of the best curtains will be heavier and thicker in size. However, they shouldn’t be hard to install on your windows or doors. Otherwise, you will end up finding these a waste of time and eventually, a waste of resources if the set-up is not successful. What are other people saying about the curtains you’re interested in? Especially on platforms such as Amazon. The fellow buyers who preceded you probably have better information regarding the state of the product you want. Simply due to the first-hand information they have. So, you may need to look at those reviews carefully. And check for about 50 or more reviews of 4-5 stars rating – they will definitely provide you with a great clue to getting the best noise canceling curtains. Anyway, are there limitations attached to these curtains? Well, apparently, yes. You shouldn’t be overexcited about curtains finishing your noise problems completely. Here are some of those limitations. When it comes to maintaining your curtains, you will need to be a real hard-worker. These curtains need proper, regular maintenance. This is because they catch dust faster and easier compared to the normal ones you know. If you’re not a committed fellow, you will not like the cleaning job. Usually, the size of these sound-deadening curtains can be huge and dominating. They will cover your door or window pretty well, but they will also get the better part of your living space. They have bigger width and are longer in height which can take up a lot of area in your home. In setting up these curtains, you will definitely need the help of a friend. Sometimes you would even require professional assistance – that’s how ‘technical’ the whole process can become. As you have learned through this post, these curtains come with heavy weight and are thick. You cannot handle them alone. Finally, do soundproof curtains work? As I mentioned earlier in the beginning, I still uphold the same stance. These curtains do their jobs just fine. They will reduce the sound echoes, but not completely block off the sound from the outside or whatever sources. Thus, if you will need absolute quietness, you can consider other methods. 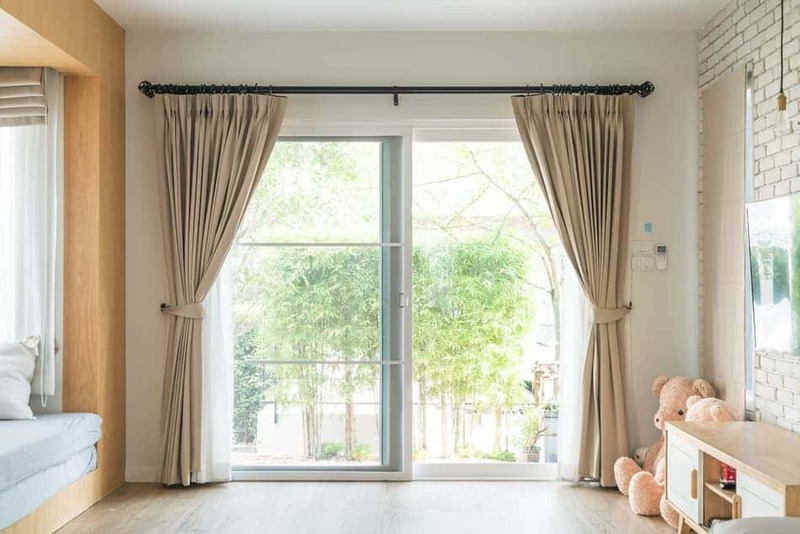 There are different types of these curtains – whether you’ll want those for residential, commercial or industrial purposes. For example, the sound screens, blackout curtains, insulated curtains among many others. When buying the curtains, remember to check a few things: check the size, weight, materials, reviews and prices of the curtains before you make a final decision. A Guide To The Best Quietest Garbage Disposal On Market. How to Soundproof a Garage Door. How to Soundproof a Room from Noisy Neighbors. How to Soundproof a Floor in An Apartment. How to Make a Generator Quiet for Camping. Quiet Treadmill for Apartments and Home Use. How to Soundproof a Window Cheaply For Complete Noise Elimination. Best Quiet Keyboard and Mouse For Gaming, Typing and Office Use. How To Soundproof a Room Cheaply Like A pro!